Chansons (French for "song") refers to any song with French words, but more specifically classic, lyric-driven French songs, European songs in the cabaret style, or a diverse range of songs interpreted in this style. A singer specializing in chansons is known as a chansonnier; a collection of chansons, especially from the late Middle Ages and Renaissance, is also known as a chansonnier. 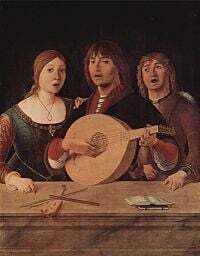 In a more specialised usage, the word 'chanson' refers to a polyphonic French song of the late Middle Ages and Renaissance. Early chansons tended to be in one of the formes fixes, ballade, rondeau or virelai, though some composers later set popular poetry in a variety of forms. The earliest chansons were for two, three or four voices, with first three becoming the norm, expanding to four voices by the sixteenth century. Sometimes, the singers were accompanied by instruments. The first important composer of chansons was Guillaume de Machaut, who composed three-voice works in the formes fixes during the fourteenth century. Guillaume Dufay and Gilles Binchois, who wrote so-called Burgundian chansons (because they were from the area known as Burgundy), were the most important chanson composers of the next generation (c. 1420-1470). Their chansons somewhat simple in style, are also generally in three voices with a structural tenor. Later fifteenth- and early sixteenth-century figures in the genre included Johannes Ockeghem and Josquin Desprez, whose works cease to be constrained by formes fixes and begin to feature a similar pervading imitation to that found in contemporary motets and liturgical music. At mid-century, Claudin de Sermisy and Clément Janequin were composers of so-called Parisian chansons, which also abandoned the formes fixes and were in a simpler, more homophonic style, sometimes featuring music that was meant to be evocative of certain imagery. Many of these Parisian works were published by Pierre Attaingnant. Composers of their generation, as well as later composers, such as Orlando de Lassus, were influenced by the Italian madrigal. Many early instrumental works were ornamented variations (diminutions) on chansons, with this genre becoming the canzone, a progenitor of the sonata. The first book of sheet music printed from movable type was Harmonice Musices Odhecaton, a collection of 96 chansons by many composers, published in Venice in 1501 by Ottaviano Petrucci. French solo song developed in the late sixteenth century, probably from the aforementioned Parisian works. During the seventeenth century, the air de cour, chanson pour boire, and other like genres, generally accompanied by lute or keyboard, flourished, with contributions by such composers as Antoine Boesset, Denis Gaultier, Michel Lambert, and Michel-Richard de Lalande. During the eighteenth century, vocal music in France was dominated by Opera, but solo song underwent a Renaissance in the nineteenth, first with salon melodies, but by mid-century with highly sophisticated works influenced by the German Lieder which had been introduced into the country. Louis Niedermayer, under the particular spell of Schubert was a pivotal figure in this movement, followed by Eduard Lalo, Felicien David, and many others. Later nineteenth-century composers of French song, called either melodie or chanson, included Ernest Chausson, Emmanuel Chabrier, Gabriel Fauré, and Claude Debussy, while many twentieth-century French composers have continued this strong tradition. See also the early medieval heroic lays called Chansons de geste, which were declaimed (from memory) rather than actually being sung. In France today "chanson" often refers to the work of more popular singers like Georges Brassens, Jacques Brel, Édith Piaf, Camille Dalmais, Olivia Ruiz, etc. This page was last modified on 5 November 2008, at 12:49.